Beethoven composed his 7th symphony between 1811 and 1812, while improving his health in the Bohemian spa town of Teplice. The work is dedicated to Count Moritz von Fries. The premiere concertof the work was on December 8, 1813. It was performed to benefit the soldiers wounded a few months earlier in the battle of Hanau. It was one of Beethoven’s most successful concerts. The second movement, Allegretto, was the most popular movement and had to be encored. Even today, the second movement remains extremely popular and is often performed separately. Poco sostenuto – Vivace starts with a slow introduction – Poco sostenuto – solemn and majestic in character. Then, on the rhythmical background we hear the motif of Part I. This first part brings many new elements, hard to decipher, because perfection expressed through sounds cannot be translated into words. Allegretto Like the opening movement of his Fifth Symphony, the Allegretto of the Seventh is an astounding example of how Beethoven could fashion a vast world from the humblest of materials. Historically, it was the most celebrated movement by far. The audience at the premiere clamored for it to be repeated, and Richard Freed reports that it was so notoriously popular throughout the following two decades that it sometimes was substituted for the slow movements of Beethoven”s earlier symphonies. While in the first part the A major sonorities conferred greatness and sumptuousness, the theme in Part II, in A minor, brings a whole new atmosphere, thus emphasizing the contrast between the two. Presto – Assai meno presto (trio) represents a splendid triumph in rendering the scherzo form. As a whole, it conveys a genuine bucolic scene with pictural meanings and associations. In Trio, the composer uses a theme from an Austrian folkloric song, the theme of which had been jotted down while Beethoven was in Teplitz. Allegro con brio manages an immense joy from beginning to the end. Practically, this is the point where dance begins. Everything is captured by movement like a popular folkloric song. The second theme is in fact a typical tune from a Hungarian dance. The great Russian composer Pyotr Ilyich Tchaikovsky thought that this segment captures “a whole series of images, full of unrestrained joy, full of bliss and pleasure of life”. Listening to this symphony’s grand finale one can hardly decide what to think more astonishing: Beethoven’s amazing creative fantasy, the impeccable form, the amazing talent in using all the musical resources in developing the themes or his compact, luscious, sumptuous instrumentation. A profusion of secondary themes obsessively hammer home forceful figures, dotted accents and sustained notes, all reminiscent of the elements animating the prior movements but now concentrated and cohesively united. The movement, and the entire symphony, culminates in a final brickbat at customary expression – the first use of a startling triple forte (fff) in any of Beethoven’s scores. Daniele Pollini was born in 1978. He made ​​his debut as a pianist at the Rossini Opera Festival in Pesaro in the summer of 1997. He also participated in the Salzburg Festival and the Ruhr Piano Festival and made ​​his successful debut in Paris and in the United States. He has appeared as soloist with the Orchestra Regionale Toscana, with the Orchestra of the Musical Afternoons and with the National Radio Symphony Orchestra In 2003 he performed at the Maggio Musicale Fiorentino under the Zubin Mehta, and in 2004 he gave a concert at the Venice Biennale. His interests also extend to electronic music. His training as a director is linked to the Accademia Musicale Chigiana conducting courses, taught by Gianluigi Gelmetti. In 2002 he made ​​his debut at the Ravenna Festival with the RAI Symphony Orchestra, with a program including the IV and VII Symphony by Beethoven. His repertoire ranges from classical and romantic authors to contemporary composers. Daniele Pollini is the son of the famous Italian pianist Maurizio Pollini. 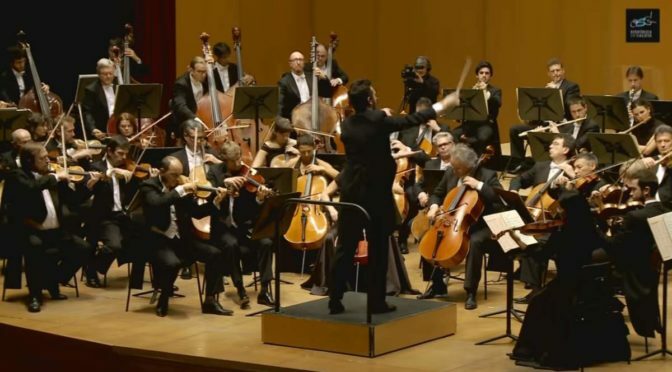 Orquesta Sinfónica de Galicia is a Spanish orchestra, created in 1992 and based in A Coruña, where it is the main orchestra in the city’s Mozart Festival. Its conductor is Dima Slobodeniouk.